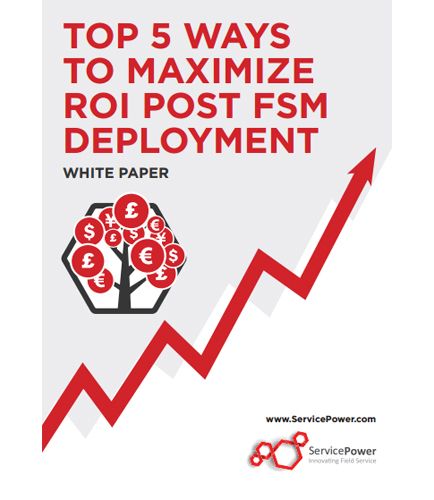 "Top Five Ways To Maximize ROI Deploying Field Service Management"
Field service management solutions are designed to address these core field service problems, a transparent and guaranteed return on investment (ROI) is promised by vendors. Choosing the right solution will allow you to reap the benefits and maximize your earnings at the same time. When employees are fully engaged with the company and where it is going, they are more likely to stay and their performance will continue to improve. As is often the case, employees and employers can have different views of company initiatives like learning. While companies see it as a great opportunity, it’s possible that your employees may see it as a negative. When not met with a good attitude, engagement can be extremely low. Read this informative whitepaper to read more .